Call me old fashioned…but Proverbs 18:22 says that he who finds a wife finds what is good and receives favor from the Lord. So…here are five things I think a guy should do…. #1 – Be Persistent In Prayer! Also–the verse I mentioned above mentions receiving favor from the Lord–guys, I think everyone of you should, when praying for his future mate, ask God for favor. He blessed me with favor–I married WAY over my head. Once again–prayer works. Don’t play games! Be up front and tell her exactly how you feel. And…don’t send your friend to do it for you. Don’t begin a “texting relationship.” Speak with her–without your friends or her friends being there…and don’t hold back. Dude–STOP IT…you are freakin’ weird! Honesty and the beginning of the relationship is NOT trying to hide who you really are OR trying to be someone else. AND…as the relationship progresses AND BOTH of you see potential…THEN the “this is how I feel” conversation needs to take place…not before. One of the things every woman in the world wants is security. SO…guys, it is WAY UNCOOL to treat her one way when you are alone, another way in front of your friends and yet another way in front of her friends. 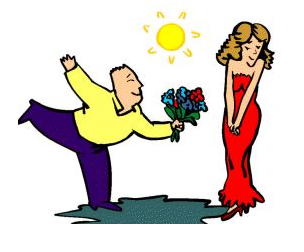 AND…it is so FIRST GRADE to say, “Well, she hasn’t been talking to me as much lately…so, I’m just going to give her the silent treatment.” That is not getting her attention–that is proving to her that you are a REAR END! Treat her the same no matter what–THAT is an issue of character. If the relationship isn’t moving along at the pace you want it to move–BACK OFF! If she says to leave her alone…then leave her alone. If she says to give her space–then give her space. BUT…if she says that she is undecided…but is really enjoying the friendship…then be her friend. What do you have to lose? The last thing a girl wants to feel from a guy is pressure to make a decision. She wants to know that she can trust him…and that he likes being around her NOT because of where he might perceive the relationship heading…but because of where the relationship actually is. Just some advice… 🙂 Soon I will do a repost for the ladies entitled, “How to be pursued by a guy!” I promise it will be fun!